What is the one cocktail you need to try at Manhattan, which topped this year's Asia's 50 Best Bars list? We ask the man in charge. Manhattan joined Singapore’s vibrant bar landscape only three years ago, and quickly racked up a number of accolades. The latest, and possibly its proudest, achievement is the No. 1 spot on this year’s list of Asia’s 50 Best Bars, which it did with a talented team led by bar manager Philip Bischoff, who’s no stranger to the scene. He was a judge at last year's Bacardi Legacy Cocktail Competition, and has spearheaded some of the world's top watering holes prior to joining Manhattan. When he was with Le Lion Bar de Paris in Hamburg, for example, it won Best New International Bar at the 2007 Tales of the Cocktail competition. 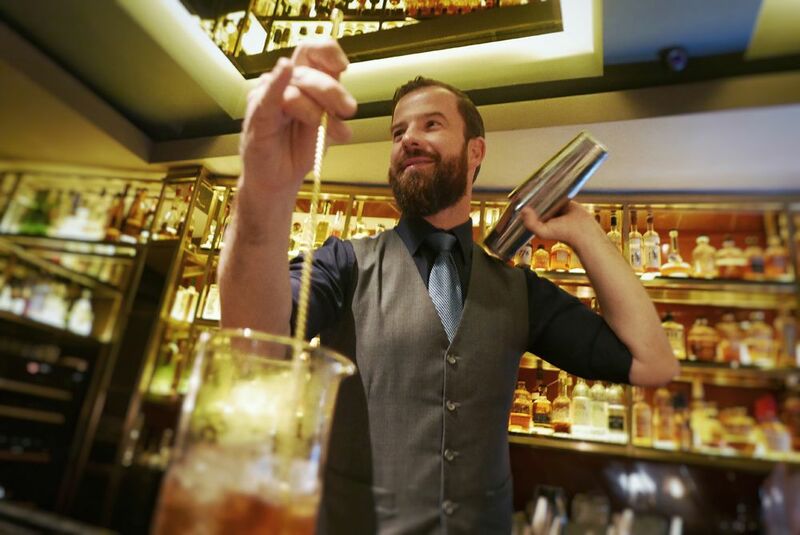 He was also at the helm of Amano in Berlin when it earned the prestigious title of Best Hotel Bar and Bar Team at the Mixology Bar Awards in 2013. Always seeking new experiences, he joined Manhattan in 2015 and has become a key figure in Singapore’s diverse cocktail scene. We had a chat with him on what to expect at Manhattan, as well as his tips to make the perfect cocktail. What has changed since Manhattan topped this year’s Asia’s 50 Best Bars list? Philipp Bischoff (PB) We’re definitely busier now; it also made our lives more challenging because everyone comes here with high expectations. We have to prove ourselves further and maintain the high standards we’ve set ourselves. PB We’ve just launched the American Whiskey Embassy programme, which puts the spotlight on American and Canadian whiskies, ryes, bourbons and white whiskies. We want to become a destination that’s known for its good selection of American whiskies, so we launched the American Whiskey Club. Our first session was with 15 members; now we plan small events that let guests sample these drinks and learn more about them. Why focus on American whiskies? PB We felt that having an American heritage and being a New York-inspired grand hotel bar is something we should highlight. After doing research of the market, we found that even though there are a few places that carry a good selection of American whiskies, no one really focuses on it. So we started a well-curated collection of about 150 spirits that we’re still expanding. We’re also looking into educating our team, as we want them to be knowledgeable about American whiskies, so they can share it with others. What are the new trends to look out for? PB Low ABV (alcohol by volume) drinks are something to look into. One drink that works really well with us is the Monochrome, based on port wine with only 20 per cent ABV. Classic drinks based on whiskies and rums have about 40 to 50 per cent ABV. Discerning drinkers also like intense flavours, like Coal, for instance. It’s another drink on the menu that’s complex and based on Austrian chocolate liquer with hints of Islay whisky. The small amount of whisky makes the drink so complex but it’s not high in ABV. Fave tip to making the perfect cocktail? PB It’s all about balance. I love drinks that have their perks and corners, and a bit rough. If I’m the one serving the drink, I want it to be well-balanced and round. Spirits you often use in your cocktails? PB: Gin, tequila and Islay whisky. PB A Bloody Mary for my mum. PB Coal, which I’ve been making since 2005. I learnt it from a friend; it was a variation of another drink which I refined and included in the revamped drinks menu at Manhattan. PB: Operation Dagger, 28 HongKong Street and Employees Only Singapore are good places to hang out at. I often visit Spiffy Dapper; I went there when I first moved to Singapore and brought friends there a few weeks ago. It’s beautiful place with chill music and great drinks. Native is also a great bar by Vijay Mudaliar. PB The lifestyle we bartenders have is pretty intense, going out five to six times a week, and we don’t get younger. So I do an annual detox where I consider what I eat and drink carefully. How long does your detox last? PB About a month, but now it only lasts a few days. Last time, I went to Thailand and it was a whole month of not having a sip (of alcohol), eating healthy food and training intensely. But after the training ended, I went to Bangkok (with friends), checked into a hotel and had my gin and soda which ended my detox. If you’re not at the bar, where can we find you? PB I won’t tell you!